It cannot have been eight years, surely? 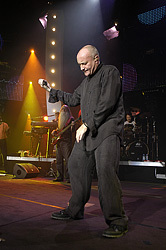 But it has – eight years ago Phil Collins embarked on his First Final Farewell tour to say, well, farewell. 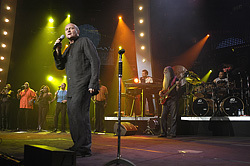 The tour went on until late 2005 with some breaks in between and took Collins not only to the conventional places to tour, Western Europe and North America, but also to Eastern Europe and the Middle East. He even played in Dubai. Anthony Mathile captured the 2005 leg of the tour very sympathetically in his documentary The Long Goodnight, a review of which you can read here. The 2004 half of the Farewell tour has also been lavishly documented. The 2DVD set Finally … The First Final Farewell Tour did not leave anything to be desired. 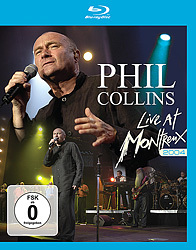 Phil published the full show (as recorded in Paris), and the set included an unending abundance of bonus material including a TV classic from 1990. Though many fans were unhappy about the setlist of the Farewell tour, the DVD was the carefree all-inclusive package deal. Eagle Vision now releases a new concert film from the Farewell tour. At face value this does not make much sense, considering the amount of material already available. Live At Montreux 2004, however, documents a special show on this tour. The set list is the same as that of the other shows, but the Stravinsky Auditorium is a comparatively small venue with a correspondingly small stage. This meant that the whole show visuals stayed in the trucks, the band came together in a smaller space and the band feeling became more palpable. Montreux was also the final show of the European tour 2004. The main film is a kind of déjà vu experience with some variations. Less technology means more music, after all, and, as it seems, more fun, so the show feels more at ease, spontaneous and the quiet songs and ballads more intense. Not everything is played absolutely perfect and on the spot, but it has all been included in the DVD / Blu-ray. It is almost strange to see Phil play in such an intimate situation. The brass section is mixed in a different way than on the Farewell DVD; they are less oppressive and fit in better with the overall band sound. The drums are as smashing as ever. In The Air Tonight sounds less threatening, but is still the highlight of the show. Other treats are the Drum Intro and the drum finale with Take Me Home. The main selling point for this release is the bonus material, which consists of major parts of the 1996 Big Band concert. This show was broadcast on the radio at the time and has been available amongst fans for quite a while in good quality. Now, however, here are the first moving pictures of the Montreux Big Band show. Quincy Jones is there, David Sanborn and even the great Tony Bennett appears for one song (he actually sang a number of songs that are missing on the DVD for no discernible reason). This concert is quite a different show and follows quite a different musical concept. It shows Phil Collins playing the drums for almost the whole concert, a Phil Collins who probably never played the drums as well again after that tour. The set list was a very interesting selection of songs: Two Hearts and That’s All became the opening twins, as it were, and Collins classics like Hand In Hand and The West Side shine in new glory. Invisible Touch is presented in a remarkable and very abstract version; Collins had played a conceptual version of this during the band introductions on his Both Sides tour in 1994/5. Against All Odds is performed very calmly. David Sanborn played saxophone on In The Air Tonight, which adds a lot to this version of the song. Towards the end of the show Collins, his band and the reinforcements from the WDR Big band tackle a jazz classic – and play Milestones by the great Miles Davis almost effortlessly and with visible joy. The undisputed highlight, however, is the Los Endos suite. It reveals when and how Collins left his mark on his former band. One really feels how big his contribution to the original was. Once more he plays some most impressive drums. Then he rewards us (or himself) by singing Always, a song already released on the Seriously Live In Berlin DVD, and Quincy Jones’ Do Nothin’ Til You Hear From Me, which he also sang on Jones’ album Q’s Jook Joint. A brisk version of the inevitable Sussudio brings up the rear. The menus are simple without special effects. One may be confused by the circumstance that one apparently cannot “play all” of the Montreux 1996 part – but if you select a single song the show begins at that point and then runs through to the end, if you so choose. The image quality is not overwhelming but quite worthwhile watching. You have to make concessions about the quality of the 1996 footage, but they are negligible. 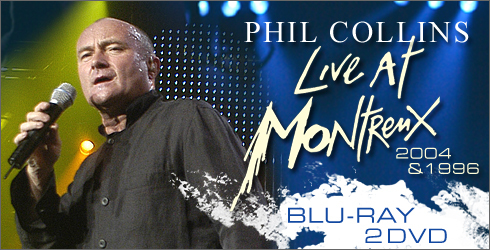 Live At Montreux 2004 was initially only planned as a Blu-ray release (this review is based on this format), but it will be released as a double DVD set, too. Both formats are to come out in March and April. Completists will have to have this release anyway. All others will enjoy this Blu-ray / DVD for the Big Band show alone. The Farewell show, too, is a fine opportunity to look back. It has really been eight years. And the big band show, that one took place 16 years ago, so these shows are a neat mathematical double. Worldwide release dates of both formats? They are listed here.